Share the post "Henkel Constructed Home for Sale"
Most people in Mason City don’t realize that Henkel Construction Company in their beginnings also built homes. Well, I just listed a gorgeous brick home this afternoon that was built in 1931 by the “old” Henkel Construction Company. It is amazing! There is indeed a compact unity to the whole home. I actually didn’t want to leave. The custom features are endless but I will share a few with you. There are windowed pocket doors that separate the living room from the hallway. 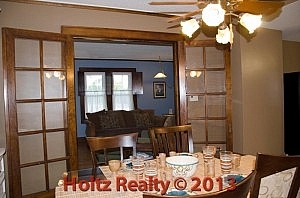 There are French doors that separate the dining room from the living room. Instead of normal closets, there are custom built-in closets/wardrobes. There is a finished basement “rec” room with a ¾ bath as well as laundry area. The current owners have not only cared for this home, but also care-given. The improvements are not your run of the mill, but rather the best that you would find. I can say without resign, this home is a keeper. The only reason the owners are selling is because they are approaching retirement and planning for their senior years. My hat goes off to them for the care they have taken in maintaining this absolutely gorgeous home.